Size - 3.5" x 5"
Exhibitor Cards are accepted by our clientele companies who are dealing in various exhibitions, conferences and events function. These cards are available in various sizes and colour combinations to meet the diverse demand of our customers. 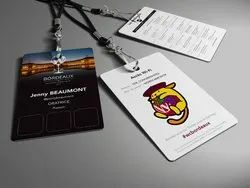 Exhibitor Cards are primarily a paper card (premium quality paper is used) but on special demand, we can also print and design on plastic. Custom variable data is also possible in these one side multicolor printed exhibitor card. Exhibitor card this is primarily a card which is used for various exhibitions, conferences and events. Custom variable data is also possible in these one side multicolor printed exhibitor cards. These are available in various sizes. 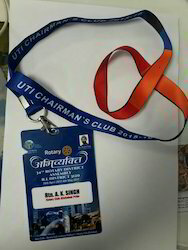 The clients can avail an extensive range of Exhibition Cards. These products are manufactured using optimum quality raw material, ensuring thier reliability, durability and clear visibility of mentioned data. The cards are widely used for guest and staff recognition in various exhibitions, conferences and events. This is primarily a paper card (premium quality paper is used) but on special demand, we can also print and design on plastic. Custom variable data is also possible in these one side multicolor printed exhibitor card. Supplier & Distributor of a wide range of products which include Corporate Cards such as Employee Card, Exhibitor Card, Corporate ID Card, PVC White Card, Photo ID Card and Student ID Card.